A few days ago my computer started acting funny with mysterious errors and crashes, it felt like it maybe should have BSOD'ed "to prevent damage to my computer", but didn't. It took half an hour to shut down. After rebooting, all 3 of my Storage Space drives were missing. The StoragePool is backed by two HGST 4TB drives and provides 1 Mirrored, 1 Stripped, and 1 Simple volume. After some time it rebuilt the Mirrored( and Simple volume and listed the PhysicalDrive as retired, after which it refused to rebuild/scan/fix the stripped volume. With enough coaxing through Powershell I was able to get into a state where it claimed a repair was possible if "More space was available". So I ordered a new 4TB Hard Disk. While waiting for the new drive to ship I ran tests (using a LiveCD because Windows won't let me touch the drive without throwing errors) on the supposedly bad drive and I can't find a problem. Best I can tell is that it's just badly corrupted. So much so that chkdsk immediately crashes when trying to run from recovery. 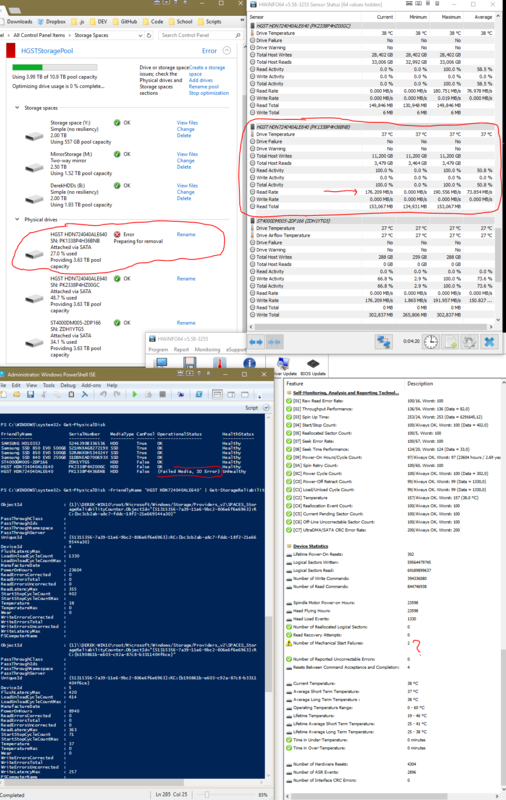 The NTFS and Disk event logs are reporting about 15,000 errors per hour. The NTFS log reports A corruption was discovered in the file system structure on volume B:. The exact nature of the corruption is unknown. The file system structures need to be scanned online. But any thing you try to do through windows results in a Fatal device hardware error, or in PowerShell gives a The repair failed or The scan failed. Today I plugged in the new drive and Windows had no problem reading off and recovering the data. It read almost 1TB no problem from the drive at full speed. Note the SMART stats and the "No Failure" and "No Warning". Windows still tells me the drive failed and doesn't let me use it. This seems like a bug in Windows. The drive appears to be fine. What do I do here? Browse other questions tagged windows-10 smart hard-drive-failure storage-spaces storage-pool or ask your own question.